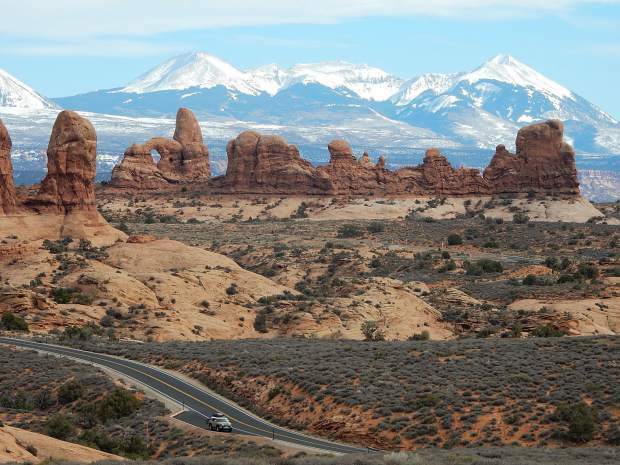 The red rock sandstone of Arches National Park creates a contrast to the snow-capped La Sal Mountains. There was something about returning to the desert last weekend that soothed my soul. While the skiing was great in February, I was eagerly trying to arrange my calendar to sneak over to the Moab area before the Invasion of the Spring Breakers. My daughter Hannah was game for the trip. We went on a desert trip nearly every spring break from the time she was in kindergarten through college. The tradition took a hit last March in her first full year in the workforce. Our first stop on Saturday was some easy hikes in Arches National Park. We’ve avoided that gem of a landscape in recent years because of the industrial tourism Moab has experienced. Arches is to Moab what the Maroon Lake is to Aspen — spectacular settings that are getting loved to death and managed by federal agencies doing their best to cope. The latest plan by the National Park Service is to start requiring reservations to visit Arches by private vehicle from March to October starting next year. Predictably, a faction of the Moab business community is more concerned about maintaining numbers than quality of experience. But I digress. The crowds were on the light-moderate side so it was a delight to make the easy but spectacular hike to Delicate Arch. We ducked behind a rock outcrop at the top to escape the winds that gusted up to 40 mph. People braced themselves to the gale, held on dearly to hats and talked particularly loud to make themselves heard. When not gazing at isolated Delicate Arch or the intoxicating combo of red rock and snow-capped La Sal Mountains, people watching was entertaining. One young woman tried several yoga poses (down dog, reverse bridge) in front of the arch for photos. After mingling with the masses on Saturday, we fulfilled our plan for isolation on Sunday. I became enthralled with a hike to rock formations called Zeus and Moses at least 25 years ago but somehow never worked the 12-mile, round-trip trek into my plans. We pulled up to the trailhead in a snow flurry shortly before 10 a.m. Sunday. We were prepared with multiple layers, stocking hats and gloves. I figured the worse the weather, the better our chance of avoiding crowds. The beginning of the hike also weeds out serious hikers from the car people. The trail plummets about 1,300 feet with some exposure and loose talus right off the bat. The snow let up shortly after we started. We trudged down a mostly dry wash surrounded by towering sandstone walls varnished with streaks of black. When we reached Zeus and Moses 5.5 miles later, we sat in silence and awe while snacking and soaking in the view of the jagged and unlikely narrow sandstone spires. We saw no one on the entire 12-mile trip. It was heaven.